BEIJING — The European Union on Wednesday joined Sweden in calling on China to immediately release a Swedish book publisher who was taken off a train in front of his country's diplomats by Chinese police four days ago. The Chinese foreign ministry on Wednesday indicated Gui Minhai, the Hong Kong-based book publisher, and the Swedish diplomats who were with him may have been breaking Chinese law. 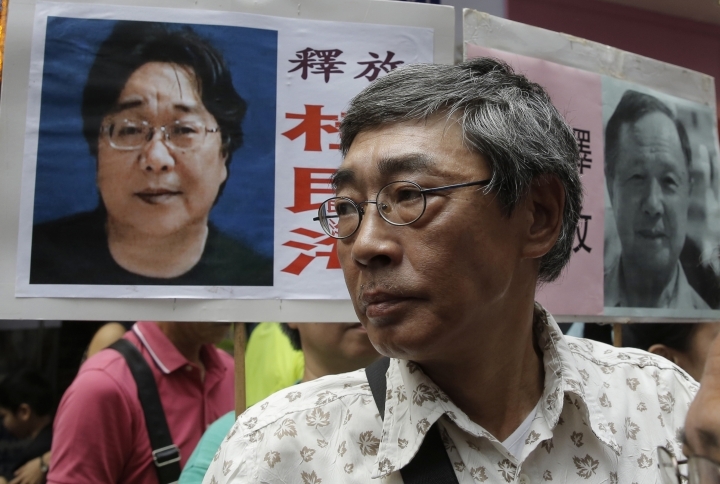 Gui was first abducted in 2015, one of five Hong Kong booksellers whose disappearances became a symbol of the extent to which China was willing to reinforce its hard line on squelching political dissent and a free press — despite international criticism. The office of EU foreign policy chief Federica Mogherini said it "fully supports the public statement and efforts of the Swedish government" on Gui's behalf. "We expect the Chinese authorities to immediately release Mr. Gui from detention, allow him to reunite with his family and to receive consular and medical support in line with his rights," it said in a statement. On Tuesday, Swedish Minister for Foreign Affairs Margot Wallstrom said in a news release that China has given no clear explanation for Gui's detention. Sweden has already summoned China's ambassador in the Scandinavian country over the 53-year-old's case. "We take a very serious view of the detention on Saturday of Swedish citizen Gui Minhai, with no specific reason being given for the detention, which took place during an ongoing consular support mission," Wallstrom said in her statement. "We expect the immediate release of our fellow citizen, and that he be given the opportunity to meet Swedish diplomatic and medical staff," she said. Wallstrom said the Swedish diplomats accompanying Gui had been "providing consular assistance to a Swedish citizen in need of medical care. "This was perfectly in line with basic international rules giving us the right to provide our citizens with consular support," she said. Gui had been running a Hong Kong publishing company specializing in gossipy tales about high-level Chinese politics when he disappeared from his Thai holiday home about two years ago. He was believed to have been spirited away by Chinese security agents to mainland China, where he later turned up in police custody. In a videotaped confession that supporters believe was coerced, Gui stated that he'd turned himself in to mainland authorities over a hit-and-run accident. He was released into house arrest in October in the eastern city of Ningbo, living in what his daughter Angela called a police-managed apartment. His daughter told Radio Sweden, the English-language service of national broadcaster Sveriges Radio, that her father was on a train with two Swedish diplomats on Saturday when a group of police officers seized him. She said her father was traveling to Beijing to see a Swedish doctor after he was diagnosed with amyotrophic lateral sclerosis, a neurological disease that he developed while in custody. Gui's 2015 abduction reinforced rising fears that Beijing was chipping away at the rule of law in Hong Kong, a semiautonomous Chinese city that is promised civil liberties such as freedom of speech until 2047. The books Gui and his colleagues sold at their Causeway Bay Bookshop were popular with visitors from mainland China, where such titles are banned. Questioned at a daily briefing about Gui's situation, Chinese foreign ministry spokeswoman Hua Chunying said she was "not aware of the details." Calls for Gui's release "don't make sense I think," Hua said, adding that "other countries should respect the competent Chinese authority's law-based handling of the foreigners' cases in China." Without giving details, Hua said "all people in China must not violate China's laws." "I would like to reiterate that all foreigners in China including foreign diplomats should not engage in activities that violate relevant international conventions or Chinese laws," she said. Under Chinese law, those convicted of a crime generally have their civil rights suspended for a period of time, although it wasn't clear whether that applied in Gui's case. The prohibitions, which are often not made public, can also include restrictions on travel. Chinese authorities also have a history of continuing to persecute political prisoners even after their release from prison and other legal strictures. Noted human rights lawyer Gao Zhisheng recently disappeared back into custody after five years of prison and three more years confined by guards at home. Liu Xia, the wife of the late Nobel Peace Prize laureate Liu Xiaobo, has been held a virtual prisoner for years despite never being charged. Since her husband's death in July while serving a prison sentence, Liu has had virtually no contact with friends or family and the authorities will not say where she is currently being held.